Don't miss the Marquette Golden Eagles play their final home game of the season this Saturday at the Bradley Center. Marquette hosts the Georgetown Hoyas in their last game of the regular season. Marquette vs. Georgetown tickets are still available for Saturday afternoon's game. 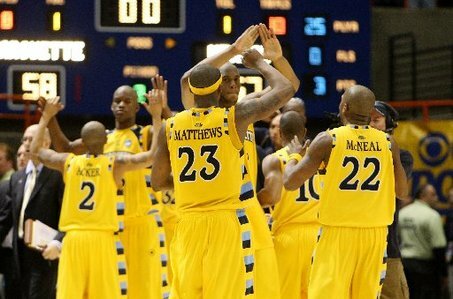 As Marquette basketball fans know, this has been an exciting season for the Golden Eagles. They boast some of the best players in the league and have earned a double bye for the first time ever, putting them into the Big East quarterfinals. Depending how the Golden Eagles play this week, the team could finish anywhere between 2nd place and 4th place in the Big East standings. Currently, Marquette is ranked in the top ten over all, which makes me wonder, will they make it to the final rounds of the Big Dance? Usually teams in the top ten make it far into the playoffs.